The steam vacuum cleaner combines steam with the suction power of a vacuum to clean carpets and floors effectively. 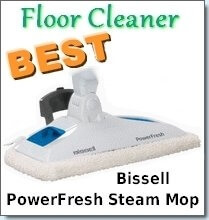 There are many steam vacuum cleaners such as those offered by Hoover and Bissell. However, a steam vaccum cleaner may not necessarily just use steam, but are more than often combined with a heated solution to enhance cleaning. 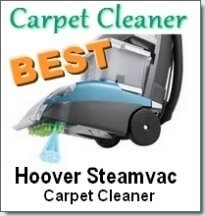 The most well known steam cleaner line is the Hoover Steam Vac. The Dual V and Clean Surge series offer professional level steam cleaning for your carpets. The Dual V technology consists of Hoover’s unique SpinScrub brushes that work together to scrub the carpet’s fibers to loosen the dirt. Heat is applied onto the floor or carpet along with a detergent solution that is automatically made for the best results. The Dual V series includes a special nozzle that provides equal suction along the length and width. There are two tank systems to keep the clean water and solution separated from the dirty solution. Hoover’s Clean Surge technology uses an innovative system for removing dirt from deep within the layers of your carpet. This includes a SpinScrub Multiple Rotating Brush System that basically uses 5 brushes to clean and scrub your carpets and floors. Like the Dual V, heat is applied directly unto the floor or carpet which enables deep penetrating vacuuming action. There are even SpinScrub hand tools so that you can effectively clean upholstery or even your car seats. Steam Vacuum Cleaners use a common technology called Hot water extraction to clean. There is actually very little if any steam that is used. Hot water with cleaning solution are the main ingredients coupled with scrubbing brushes and a vacuum to suction out the dirty solution. 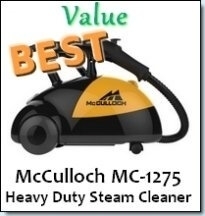 Therefore there is much confusion in the term “steam vacuum cleaner” which actually does not use steam. If you have every hired a steam cleaning service for your carpets, then they have most likely used the same hot water extraction method. This is a very popular method which does not leave very much cleaning solution in your carpet. A spray of hot misty water is sprayed into the carpet to apply a cleaning solution. The causes the dirt to be forced out from within the carpet which is then suctioned out by a powerful vacuum. There are many popular cleaning services that use this method including the Rug Doctor Stanley Steemer and Steam Sweeper. • New technology makes this a much more refined and effective method as was used in the past. 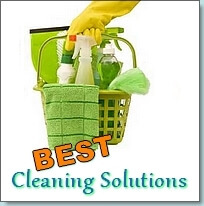 • It leaves behind less residue than other cleaning methods. • You have to avoid walking on the carpets while they are drying otherwise they may become soiled again. • Some have reported a leaking problem with this cleaner. • Some wish that the dirty water container was a bit larger. • Some report leakage issues, however this can be prevented by locking the rod in place by squeezing the trigger and pushing the Clean Surge button. This will create a loud snap which will indicate that the cleaner is well secured and won’t leak.